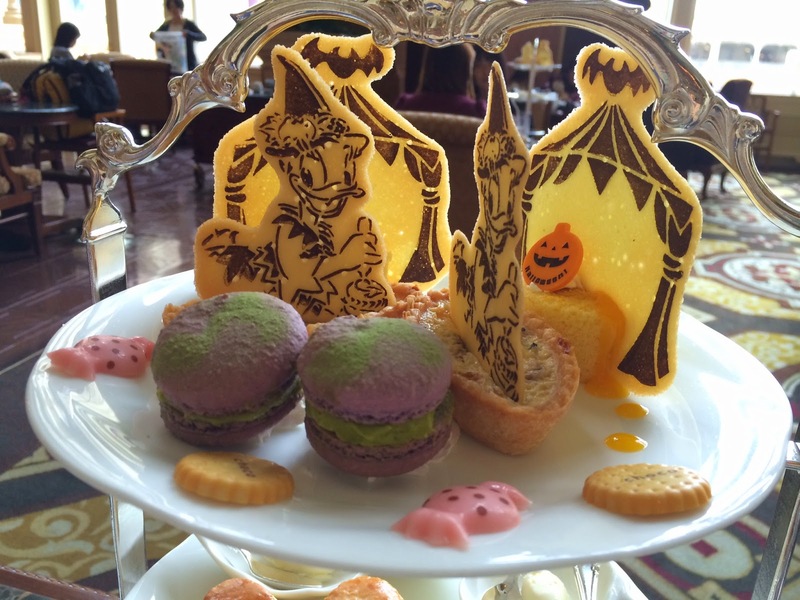 We went to Disneyland Hotel to try Halloween themed afternoon tea before going to Disney Sea. 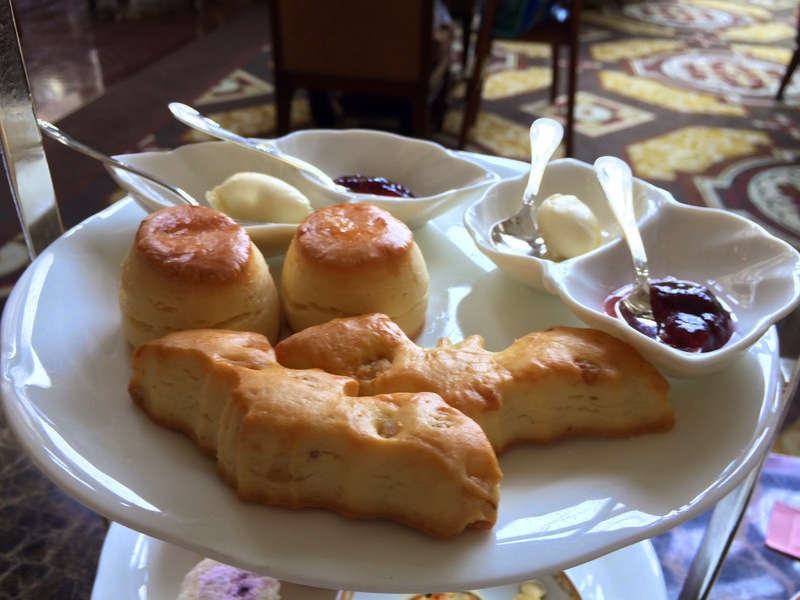 "Dreamers Lounge" is located on the second floor of Disneyland Hotel, and afternoon tea set is available for a limited number from noon. * They don't define the number though. 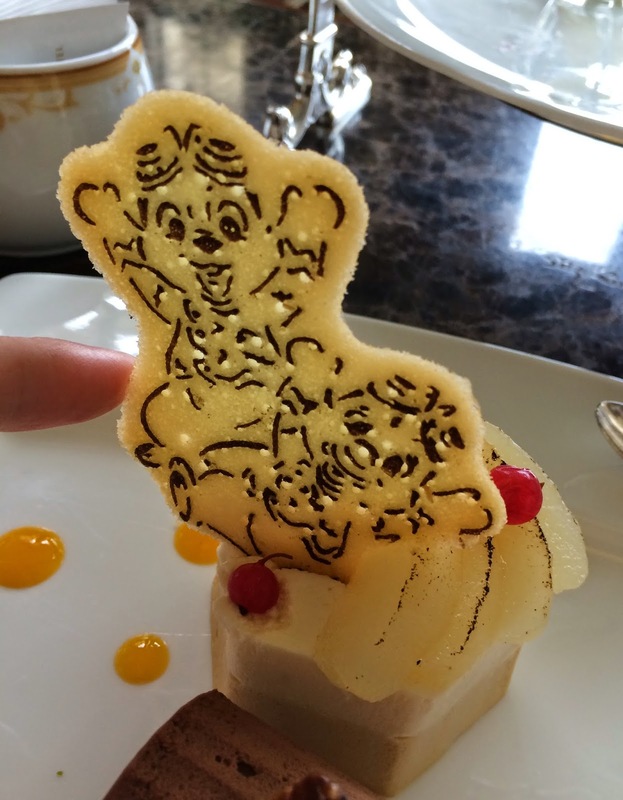 My husband and friend ordered afternoon tea set, and I got a Chip 'n Dale Dessert Medley. And I also got Popping Maracas (non-alcoholic cocktail). Popping Maracas was a set of 2 different mocktails as maracas is a set of 2. 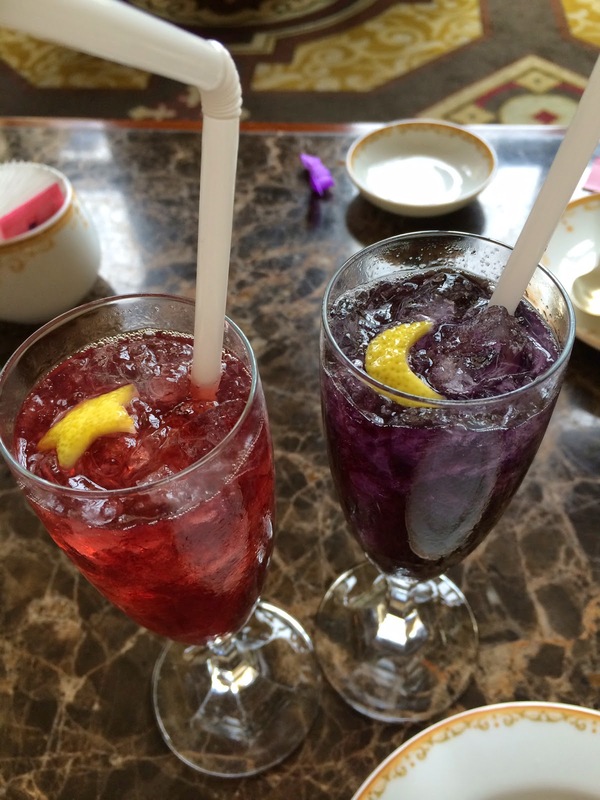 On the left, it's grape jelly, strawberry syrup, guava syrup and fresh lemon juice with a star-shaped lemon peel. On the right, it's grape juice, green apple syrup, blue syrup, fresh lemon juice and club soda with a lunar-shaped lemon peel. 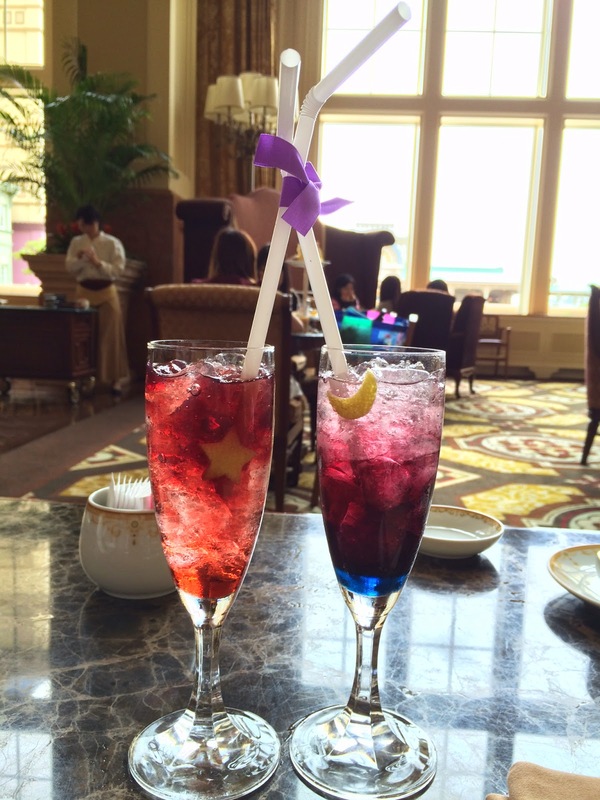 Both were pretty sweet but the purplish mocktail tasted a little bit more refreshing. 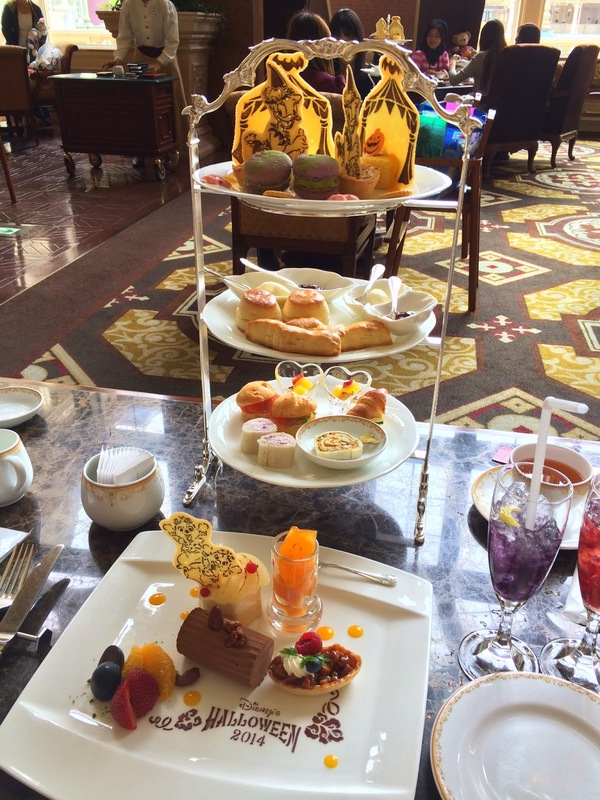 2 afternoon tea set was served in one stand, and the flat plate is the Dessert Medley. On the top, there're Pumpkin Roll Cake with a thin cookie with a tent motif with a bat on the top, Mushroom and Bacon Quiche with Daisy in Halloween costume, and Pistachio and Cassis Macaron. 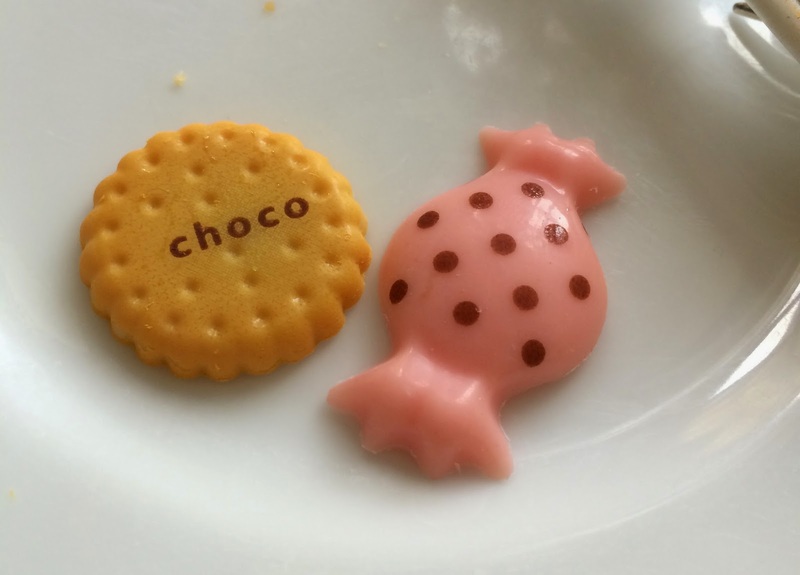 And there're biscuit and candy shaped chocolate. On the second plate, there're bat-shpaed walnut scones and plain scones with strawberry jam and clotted cream. 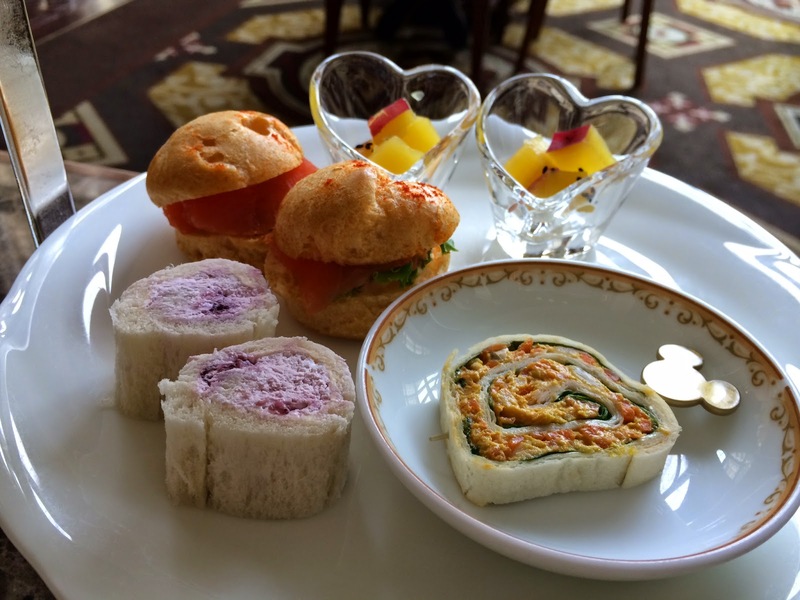 At the bottom plate, there're Mixed Berry Roll Sandwiches, Tortilla Roll with Spicy Chicken, Smoked Salmon Trout and Mini Potato Salad Puff and Pickled Sweet Potatoes. The sweet potatoes weren't sour but only sweet even though it's said "pickled." After finishing all the foods, they brought a plate which had Sweet Potato Mont Blanc, Blueberry Cream Puff and Creme Brulee. This is "Chip 'n Dale Dessert Medley." 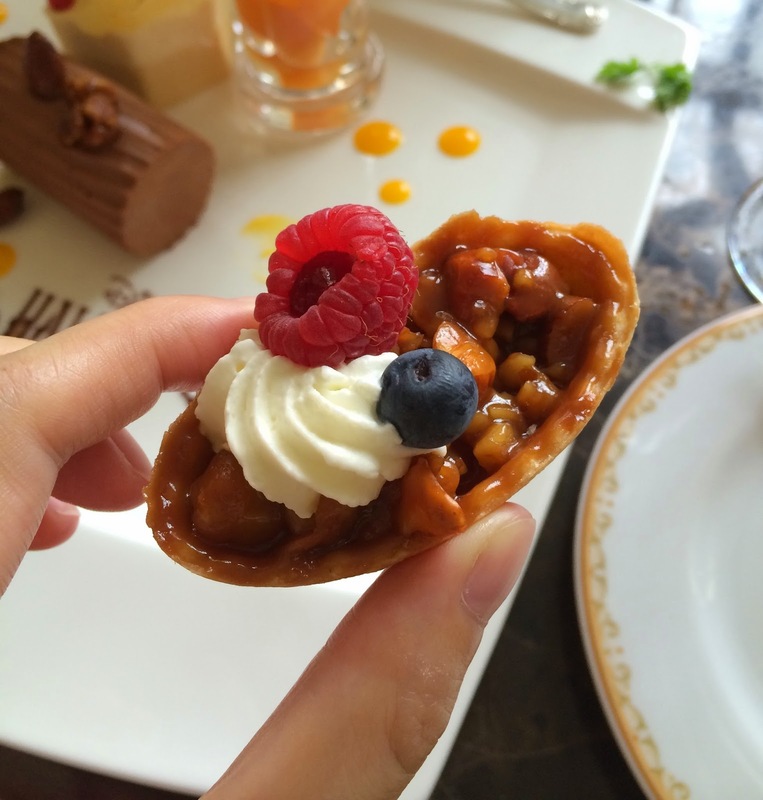 Nut Tart was decorated with a blueberry, a raspberry and whipped cream. 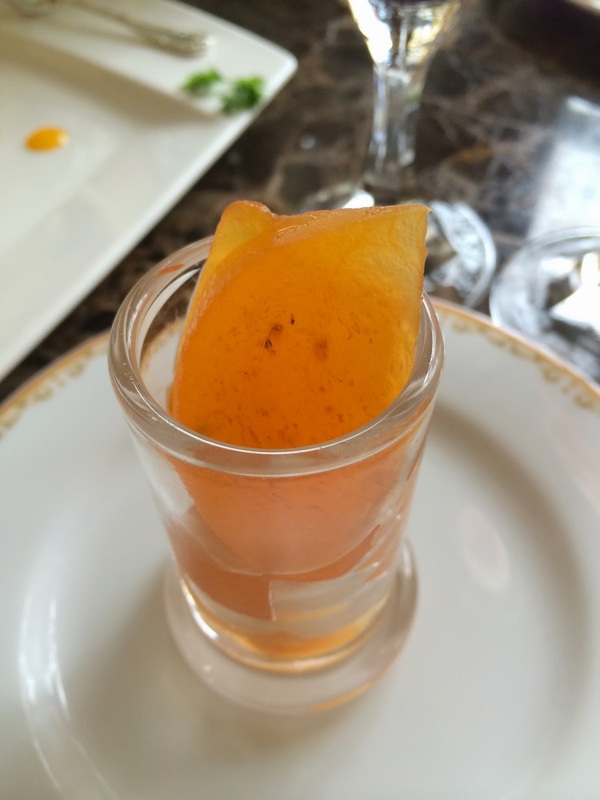 Persimmon Jelly and Compote had 2 pieces of persimmon compote and there're several cubes of persimmon jelly. 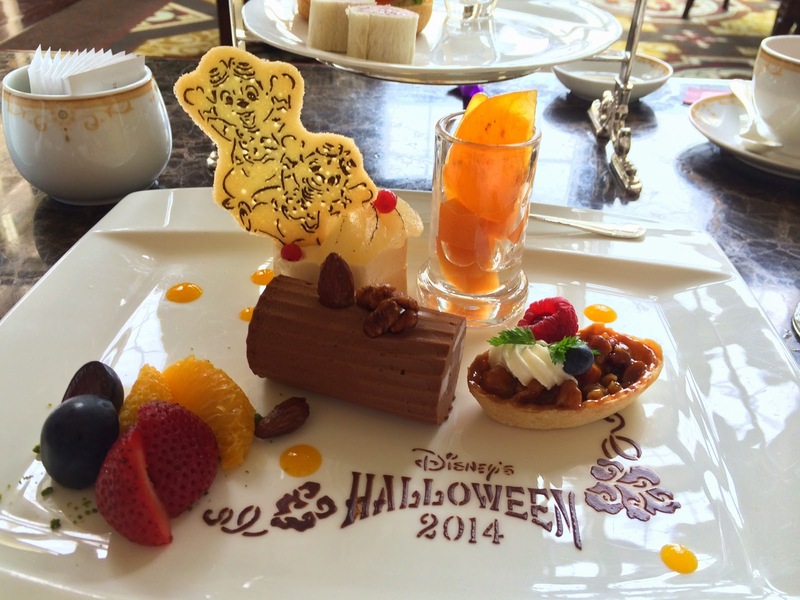 Pear and Caramel Iced Parfait was refreshing and decorated with a thin cookie with Chip 'n Dale. 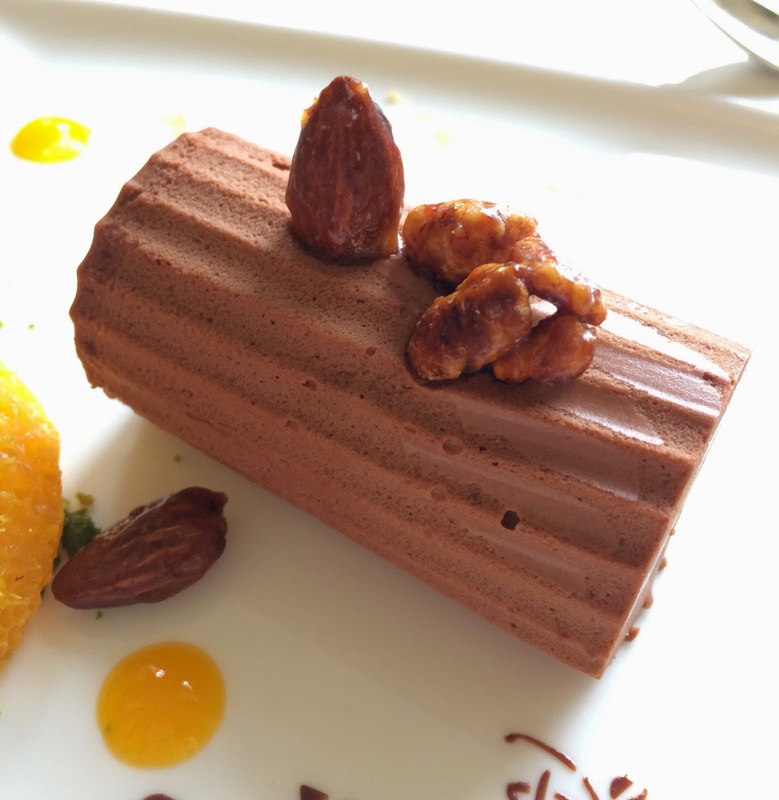 Chocolate Mousse with Orange Cream Filling looked like a log and topped with walnuts and almonds.